God-honoring short-term mission (STM) trips require more than a packing list and a prayer meeting. 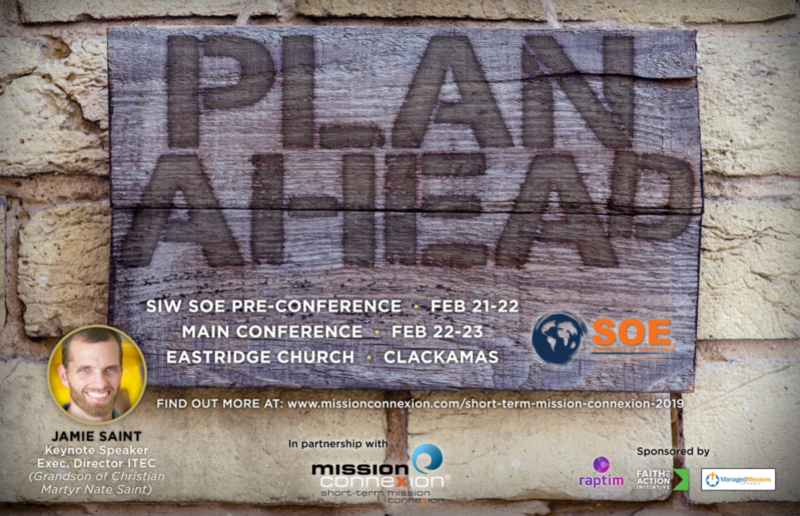 Short-Term Mission ConneXion 2019: PLAN AHEAD will equip you to lead intentionally and thoroughly. Worship, network, and learn with others passionate about taking the gospel to the ends of the earth. You’ll hear from Jaime Saint, Executive Director of I-TEC and grandson of Christian Martyr Nate Saint, and Brian Heerwagen, CEO of Standards of Excellence (SOE) in Short-Term Mission. Both speakers will challenge and inspire you as you prepare for your next STM trip. STM ConneXion 2019: PLAN AHEAD also includes round table discussions, a Q&A time with a panel of experts, and workshops that focus on a variety of topics including the Seven Standards of Excellence for STM leaders from churches, agencies, and schools..
SOE’s Standards Introductory Workshop (SIW) is a 10-hour seminar designed to help practitioners understand how they can incorporate and achieve competence in all Seven Standards. The workshops are taught by experienced SOE trainers, are interactive, and use case studies and small group discussions. It allows organizations to discover the implications of the Standards and begin applying them to their specific ministry context. The SIW includes a resource notebook and *lunch on the second day.